Knocking down walls at East Street Mews to help end youth homelessness. Home / Uncategorized / Knocking down walls at East Street Mews to help end youth homelessness. 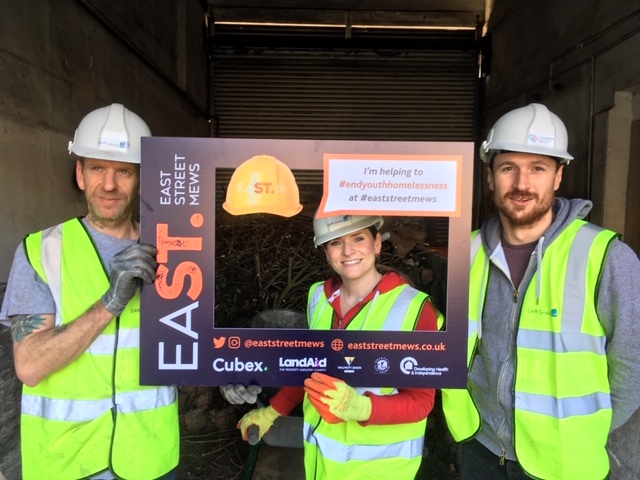 Over the last month, our East Street Mews partners have been busy getting the site ready for the next stage of the redevelopment of the buildings on Bedminster Parade. Work on site has been focussed on closing out pre-commencement conditions, demolishing the rabbit warren of temporary structures to the rear of the building and the strip-out of redundant wall coverings and materials within the property. Kicking off the first stage of the demolition, a team from Lancer Scott, South West Retail, Developing Health & Independence, JLL and Anderson Parslow worked enthusiastically over three weekends to carry out clearance in and around the buildings, knocked down walls and cleared rubble and vegetation. 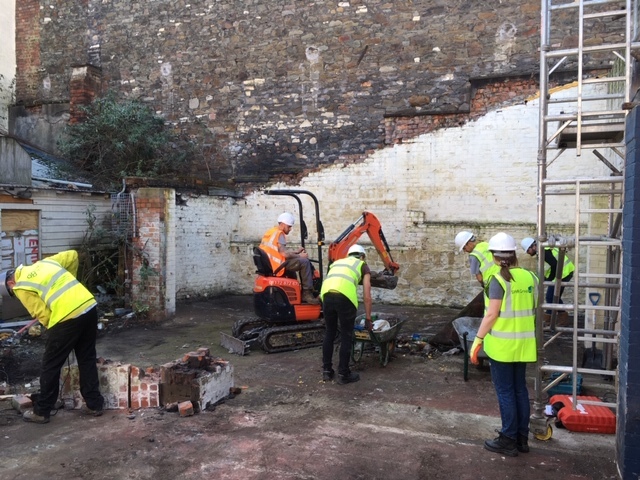 Supported by Alide Tool Hire & PlantWorks who donated machinery to assist in the demolition and TR Scaffolding who provided scaffolding to support some structures during their demolition and ETM Recycling who removed over 10 tonnes of material cleared by the team. Volunteers & clients from our charity partner DHI worked hard on site removing rubble. One DHI client who had experienced homelessness, talked about the huge difference that somewhere like East Street Mews would have made to him in his younger years. Research suggests that intervening and supporting homeless people at an early stage helps to prevent an escalation of poor better mental and physical health, improves access to education and employment and reduces social exclusion. Lancer Scott our Principal Contractor for the pre-construction stage of the redevelopment of East Street Mews has committed significant man-power and oversight to the project so far, with Ray Kenny leading the charge both on-site and behind the scenes by asking the local construction supply chain to provide additional support. 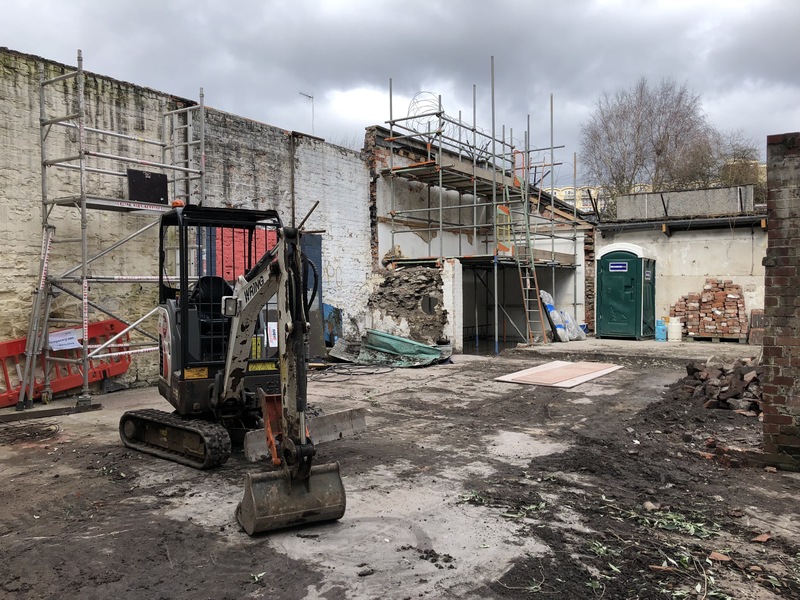 The second stage of demolitions began apace when local demolition business Wring Group, answered our call for further assistance from a demolition expert to undertake the final stages of this messy task. Big thanks to John and Dean Wring for stepping in and committing to help end youth homelessness. Trading since 1926 this family-run company, Wring Group followed on from the substantial clearance work completed in stage one taking over the building site for 6 days in order to complete the removal of the remaining walls and buildings to the rear of the property, removal & replacement of the ramshackle stairs to the upper floors of the building and in order to complete the internal strip out of the building. We are now able to begin groundworks and scaffolding within the building which will provide structural support for the next part of the renovation. 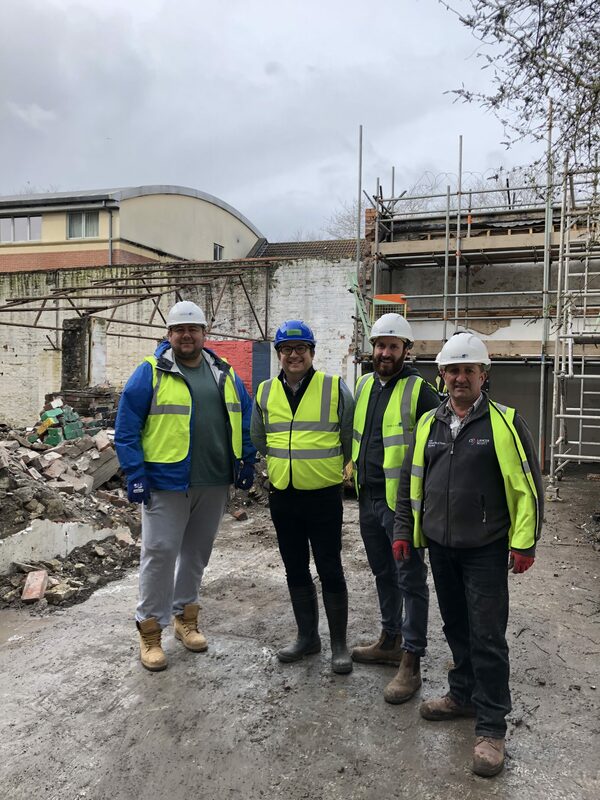 Special thanks must go to Wring’s site manager Dave and his team on site who stopped work on site to accompany a group of visitors hosted by Kate Francis of Willmott Dixon and Eleanor Lynch of East Street Mews as part of Construction Open Doors Week. It was an excellent opportunity to demonstrate the considerable effort it has taken from all involved to get to this point in the project. This piece of work has seen our partners not only working together side by side, but also taking time out of their weekends to complete the works over and above their day to day jobs and commitment to creating affordable housing for young people at East Street Mews. A labour intensive piece of work, the demolition has required a lot of time, energy and coordination and we are hugely grateful to the hard working team of local construction companies and volunteers who have worked together to donating around 500 hours of their time and expertise to get the job done. We would like to thank everyone who has been involved in the demolition works, it is an excellent example of how working together, taking on specific parts of the task in hand can achieve something really impactful; the difference on site is dramatic! Can you donate your time, skills or money to help convert East Street Mews into vital homes to reduce youth homelessness? Perhaps you have a construction skill or materials we could use on site? Maybe you would consider raising money for the project to purchase much-needed materials? Would your business would like to donate volunteering days as part of your Corporate Social Responsibility efforts? Any amount of help will make a big difference, so whatever you can do, we’d love to hear from you. To find out more about fundraising or any of the practical ways you can get involved, please contact Eleanor Lynch on eleanor@eaststreetmews.co.uk.